Not too long ago, dining options near Exposition Park were limited, save for a few fast-food chains and mom-and-pop spots. The Fields LA, however, is changing the game. 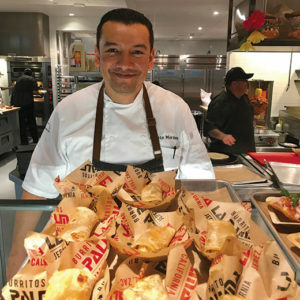 The exciting new food hall and full-service restaurant offers a plethora of dining opportunities for locals, tourists, USC students and faculty, and perhaps most importantly, the attendees of the new 22,000-seat Banc of California stadium. 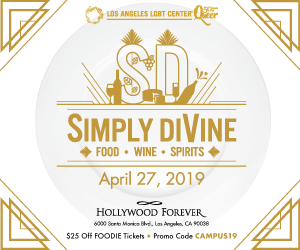 The first of the three floors features a number of famous Los Angeles area chefs cooking up delicious bites. Otium’s Timothy Hollingsworth, at the C.J. Boyd’s Fried Chicken counter, offers fun sandwiches named after Los Angeles spots, such as the Malibu, East LA, K-Town and Otium. For kids, Hollingsworth offers chicken strips, waffle fries and his signature banana pudding with vanilla wafers. I tried the East LA sandwich with lime crema, cilantro, cabbage and salsa, and savored each bite. Next door at Akko Port, the affable chef Roy Ner offered a warm smile as he handed out his laffa rolls. Ner is a star chef in Sydney, Australia with two successful Middle Eastern restaurants, including the critically acclaimed ARIA, under his belt. I particularly enjoyed the playfulness of his chicken laffa roll, which was filled with charcoal eggplant, golden beets, slaw and cultivated yogurt. Other items on his menu include falafel wraps, a smoked hummus bowl, pickles, and organic grain and raw root vegetable salads. Lucky for visitors at The Fields LA, Ner will be making the 14-hour flight from Sydney to Los Angeles every 10 weeks to introduce new seasonal delights to his menu. Two other premier chefs featured on the first-floor are Jason Fullilove, of Barbara Jean, and Shirley Chung, of “Top Chef.” Fullilove prepares exciting American soul food, including jambalaya, slow-cooked barbecue ribs, oyster po’boys, crawfish mac and cheese, and a soul food bowl filled with braised greens, black-eyed peas, sweet potato latke and bacon on steamed rice. Next door at Ms. Chi Café, Chung offers her delicious dumplings filled with chicken, shrimp and pork. She also makes pot stickers with beef and sweet carrots, and a vegan version filled with spicy tofu. Chung also offers specialty tea beverages, including milk tea, jasmine green tea with fresh chopped peaches, and a signature cheese-foam oolong tea. My feasting wasn’t over yet though. I also enjoyed small plates of shrimp ceviche, fresh shrimp and octopus tostaditas, and chips with guacamole and salsa from Coni’Seafood, the eatery led by Connie Cossio and her daughter Bianka. The fish was all very fresh – all imported from the Sinaloa and Nayarit states of Mexico. Burritos La Palma offers chef Alberto Bañuelos’ special birria de res burrito, one of the beloved dishes of late food critic Jonathan Gold. The savory and spicy beef stew flavors had me hooked after one bite, and I quickly understood why Gold was such a fan. Italian classics can be found at The Fields LA as well. Piccolo Antico Pizzeria Focacceria features chef Chad Colby and his team making thick focaccia-crust pizzas and sandwiches reminiscent of those in Rome. Pizza options include a Margherita, pepperoni, tomato, white sausage with sage, and three-meat pie topped with bacon, sausage and salami. Sandwiches on the menu include mortadella, salami, porchetta, sweet coppa and vegetarian with ricotta. Don’t forget the sweets – Katie Hagan-Whelchel, of “Cooking Under Fire,” and pastry chef Leah Chin-Katz have established Sweet and Savory inside the hall selling salads, snacks to go, along with baked items, including cupcakes, teacakes, cookies, bars and éclairs. For drinks, Nick Meyer and Julian Cox designed the cocktail program, with plenty of seasonal concoctions and frozen options. A beer garden outside of the stadium serves beer, wine, mixed drinks and boozy shakes. The second floor of The Fields LA features a sit-down restaurant and bar called Free Play, Hollingsworth’s stand-alone restaurant scheduled to open in October. The Fields LA may have just opened, but the dining hall, with its collection of popular local chefs, has already scored. The three-floor space is open daily for lunch, snacks and dinner from 11 a.m. to 10 p.m. $-$$ 3939 S. Figueroa St., Los Angeles.